Cuyahoga County, Ohio is home to nearly 1.3 million people. Tucked away in the northwestern corner of the state, Cuyahoga County, Ohio and has much to offer all walks of life. The biggest city within this county is Cleveland and it has been famous for televisions shows and the many attractions that this area provides. Life is busy here and those who love the big city life will enjoy the hustle and bustle that comes along with living a thriving metropolis like Cleveland. But not all of Cuyahoga County is lights and attractions, some parts of the county have farm land and ample room to roam. So what can a person do in this county that they can’t do any other place in the world? What makes this area so special? Most people come to Cuyahoga County, OH for the attractions. First, one of the best amusement parks in the world is located here, Cedar Point. With more than 8 giant roller coasters and plenty of entertainment for all, tens of thousands of people enjoy this park every year. Cedar point has long been one of the biggest and best parks in the Mid-West and had more than enough to offer thrill seekers. The beautiful Lake Erie region brings about a great deal of activities that are sure to keep anyone busy. From fishing for the world famous walleye to the festivals and waterfront activates, this is the place to be in Cuyahoga County. Visit the wonderful islands like Put-n-Bay and Kelly’s Island bring many well-wishers for fishing and boating. Some come for the historic vineyards and wine companies while other prefers the gentle breezes the lake provides. Either way, it’s a great place to relax after a long day of work. The Rock and Roll Hall of Hame attracts a great deal of people. Located right on Lake Erie’s shore, this institution was built in 1997. Those who love the classic music can see great memorabilia and hear classic tunes while trolling through the museum. Big names like John Lennon and Eric Clapton have frequented this establishment helping to put it on the map. Life can’t all be about fun and games, there are plenty of other things to consider about Cuyahoga County, like the ample jobs. As one of the most populous counties in Ohio, the job market is steady here. It was actually ranked the 7th best job market in the country, making it a great place to live and work. Good things can also be said about the housing market, especially in Cleveland’s suburbs. While the housing market took some hits during the recession, it never had near the issues that other areas in Ohio did. The medial housing range is around $85 thousand dollars, way less than the Ohio average of $140 thousand dollars. The average resident is 35 years of age and this is partly because it is a great place to raise a family. 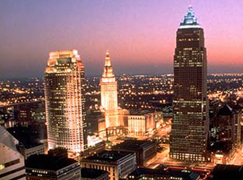 With affordable living and ample jobs and entertainment, Cuyahoga County is the place to be.